The incomparable workmanship and unsurpassed quality that is associated with Howard Miller is found in this impressive Howard Miller Cabernet Hill Wine Console. 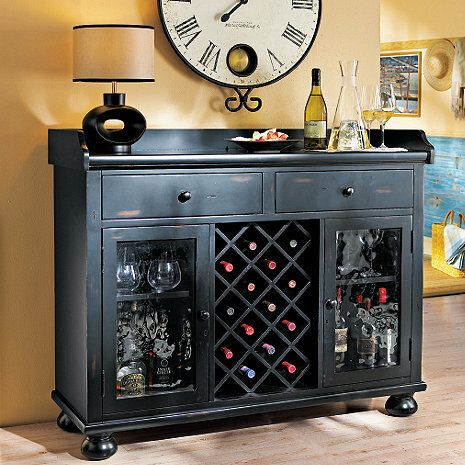 Finished in worn black on select materials, hardwoods and veneers this wine console offers a center wood rack that holds up to 14 wine bottles*. Two top drawers and side shelving allow you to neatly tuck away keepsakes, stemware, spirits and bartender's guides. A decorative apron surrounds the serving area on three sides, and bun feet create a pleasing accent on the base. Adjustable levelers on each corner allow for stability on uneven and carpeted floors. Locking door for added security. Size: 41"H x 48"W x 17"D. Comes fully assembled. This item ships directly from the manufacturer via White Glove Delivery. Please allow 2-3 weeks for delivery. Select items will have additional shipping charges, please see above for this item's additional shipping charge. Does this cabinet come in other finishes? BEST ANSWER: Unfortunately, there is only one finish available for the Howard Miller Model # 695-002. BEST ANSWER: Yes, there are 10 or 11 holes on each side for easy adjustment. Yes they are. Love my cabinet. Very well built. Can u put a wine cooler in this.? BEST ANSWER: I don't think so. Looks great in the back of our living room, a beautiful piece and efficient storage unit. Love the piece....perfect for my dining room. Great quality. Quality, fine furniture grade console. We like this cabinet very much. I ordered a piece of black glass to cover the top so we don't scratch it. We use it more as a liquor cabinet but it's nice to have the wine storage as well. Well made, fits more than I expected and like the raised area around the top to catch any spills. I love that the top serving area is 4 or 5 inches higher than counter height as well. Nice looking without being flashy or bulky. Well packed for the trip . Very accommodating delivery men and a wonderful addition to my home.